Meet the diverse demands of new professional workflows with innovative GPU ray tracing capabilities, Deep Learning, and advanced shading. 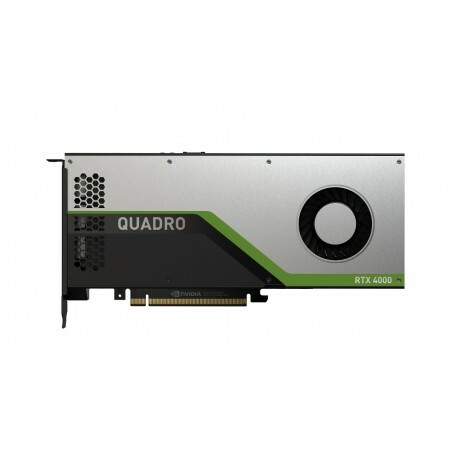 The NVIDIA® Quadro RTX ™ 4000 graphics card, based on the NVIDIA Turing ™ architecture and the NVIDIA RTX ™ platform, delivers state-of-the-art performance and advanced features within a Single-slot PCI-e configuration. Design and create content in a revolutionary way with better data access time and faster time-to-market. The Quadro RTX 4000 is designed, built and tested for demanding professional computer visual workflows. Validated on OEM workstations and certified for professional software applications, Quadro delivers the performance, stability and reliability professionals demand.